There are several great ways to get to Manuel Antonio National Park in Costa Rica. From flying to driving to public buses, I’ll discuss the best travel options to and from this beautiful beach destination. Flying is one of the best way to get to Manuel Antonio National Park. Airplanes don’t get caught in traffic jams, and you’ll enjoy spectacular views of Costa Rica’s mountains and coastline along the way. Although you don’t need a car in Manuel Antonio, it’s easy to rent one when you arrive (see below). High season prices run anywhere from $75 to $140, one-way. The exact fare depends on how much luggage you bring. You’ll be charged different rates for 27 or 40 pounds. Make sure you fully understand the baggage fees before you travel. “Locos” discounts ($40 one-way) are sometimes available for passengers carrying less than 15 pounds of luggage. “Green Season” discounts are also available in the depths of the rainy season. In many ways, driving a rental car is a great way to get to Manuel Antonio. You can travel on your own schedule, and you’ll enjoy beautiful Costa Rican scenery along the way. Starting from San Jose, you’ll descend 4,000 feet (1,200 meters) through the mountains to the Pacific coast along Route 27. You’ll then exit onto Route 34, which parallels the Pacific Ocean en route to Manuel Antonio. Added bonus: If you have a car in Manuel Antonio, you can visit some beautiful, uncrowded beaches nearby. Want to learn more about beautiful, hidden beaches near Manuel Antonio? That said, many people discover they don’t need a rental car once they’re in Manuel Antonio. Taxis are plentiful, and there’s a public bus that travels back and forth along the main road. For less than a dollar you can hop on the bus, which offers easy access to hotels, restaurants and the entrance Manuel Antonio National Park. In the early 2000s, driving to Manuel Antonio from San Jose meant a long, twisty journey through narrow mountain roads. Along the way, you’d cross single-lane bridges that caused traffic jams. The drive often took several hours. In 2010 the new Caldera Highway (Route 27) opened, reducing drive time to the Pacific coast to roughly an hour. Although traffic is sometimes an issue (see below), Route 27 makes driving to Manuel Antonio easy. Important Note: Route 27 is a toll highway. Tolls must be paid in Costa Rican colones. There are three toll booths between San Jose and the Pacific coast. Together they cost roughly ₡2,000 colones (about $4). Traffic is sometimes an issue on Route 27. This is especially true when leaving San Jose on a Friday afternoon, or returning to San Jose on a Sunday afternoon. Gringos aren’t the only ones headed to the beach. San Jose’s three million residents also love driving to the coast on weekends. If possible, avoid Route 27 on weekends and holidays. There are lots of fruit and vegetable stands along Route 27. As you approach the small town of Orotina from San Jose, you’ll start to notice ramshackle Fruterias (“Fruit Vendors”) on either side of the road. If you like snacking on fresh fruit – or you’re planning on cooking during your trip – it’s worth pulling over here. The selection is terrific, and the prices are very low. As you drive from San Jose to Manuel Antonio, you’ll see lots of hand-painted signs along the road advertising “Pipa Fria!” In Costa Rica, pipa fria mean “cold coconut water.” Don’t miss an opportunity to pull over and buy a pipa fria. For less than a dollar, a pipero (Coconut water vendor) will chop off the top of a coconut with a machete, insert a straw, and hand over liquid sunshine. Warning: once you’ve tried fresh coconut water, bottled coconut water will never taste the same! The muddy brown Tarcoles River is filled with crocodiles, which can be seen from the Tarcoles bridge along Route 34 (aka the Costanera Sur). The bridge is located 6.8 miles (11 kilometers) past the junction of Route 27 and Route 34. It can be difficult to spot the poorly marked Tarcoles bridge. Look for Restaurante Los Cocodrilos and Restaurante Nambi, find a parking space, and then walk onto the bridge. The only thing scarier than the crocodiles – which can grow to 15 feet (4.5 meters) – is the dilapidated bridge! It’s often possible to see over a dozen crocodiles at one time. The most I’ve personally counted is 37! Private shuttles are one of the best ways to get to Manuel Antonio. These comfortable vans provide door-to-door service from the San Jose airport (or your San Jose hotel) to wherever you’re staying in Manuel Antonio. The best vans even offer wifi. Private shuttles are also available between Manuel Antonio and many popular Costa Rica destinations, including Monteverde, Tamarindo, and Arenal. The cost of a private shuttle from San Jose to Manuel Antonio is about $55 per person. 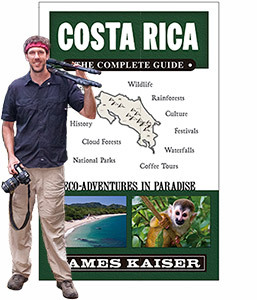 For a list of private shuttle companies I personally recommend, include ones with wifi, check out Costa Rica: The Complete Guide. Tracopa buses (2221-4214) run between San José and Quepos throughout the day. Try to take a directo (“direct”) bus rather than a collectivo (“collective”) bus, which makes multiple stops and is two hours longer. The directo bus is about 3.5 hours. Cost: ₡4,500 (about $9). Tracopa buses depart San José for Manuel Antonio at 6am, 6:45am, 9am, 10:30am, noon, 1:15pm, 2:30pm, 3:30pm, 4:45pm, 5pm, 6pm and 6:30pm. Tracopa buses depart Manuel Antonio for San José at 4am, 4:05am, 6am, 7:30am, 9:30am, 10am, noon, 12:05pm, 1pm, 2:30pm, 2:45pm, 3pm, 5pm and 5:30pm. If you’re starting from San Jose, it’s possible to take an Uber to Manuel Antonio. The 3.5-hour drive costs around $150. That’s a lot, but it’s cheaper than an official taxi. If you’re considering this option, well, I’m jealous! Manuel Antonio’s rugged coast is gorgeous, especially from the water. Arrive by boat and you’ll enjoy a spectacular introduction to Costa Rica’s tropical charms. For those of use without a private yacht … well, we can continue to dream. The rest of you should get in touch with Pez Vela Marina in Quepos. They can handle all your boating and docking needs. Discover the best Adventures, Tours and Restaurants in Manuel Antonio!